To switch to R1C1-style addressing, select Tools, Options from the main menu. On the General tab, check the box for R1C1 reference style (see Figure 6.1). 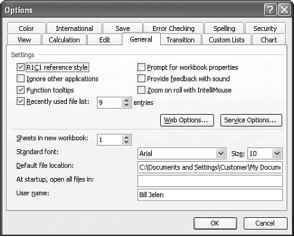 Checking R1C1 reference style on the General tab of the Options box causes Excel to revert to R1C1 style in the Excel user interface. After you switch to R1C1 style, the column letters A, B, C across the top of the worksheet are replaced by numbers 1, 2, 3 (see Figure 6.2). In R1C1 style, the column letters are replaced by numbers.